Though there are a number of beneficial factors and technology boom in the 21st century, finding a job is still a puzzling process as the competition for positions is still stiff and difficult. Days have vanished where job questers look for newspaper ads and apply for the same with a cover letter and resume. The formal wisdom for hunting a job applies true in the 21st century. The old fashioned traditional methods of job search have been overcome by the fast track job search methodologies in this century. It is in the 21st century that number of job opportunities have popped up. A good etiquette is enough to land up with a good job. This article would take you through a few tips about the various 21st century job search. Social networks are a gift for job questers as they also play their part in the job hunt. LinkedIn, Google+, Facebook, and Twitter are few social network sites which present an image of new media proficiency and assist you in staying linked with professional contacts. In that manner Google+ and LinkedIn are special communities as they are dedicated to particular industries. There are a number of special features of these social network sites, as they have job listings within them. And LinkedIn is more famed as it has references and recommendations that arise from colleagues. A personal level of usage can help you gain job with social network websites. The power of the internet is being harnessed these days by almost all employers to advertise their vacant positions. There are certain companies who still make use of newspapers for job advertising in case they require local candidates. But the 21st century has made advertising through internet as their basic search criteria. The Online presence of a candidate which takes into account social media network and personal website are few aspects employers look out for in order to recruit applicants. Internet presence can be proved these days by purchasing a domain name and posting your samples. This makes you stand out of the crowd and you’re noticed. Discussion communities and social network sites are few places where the URL of your websites can be posted, which offer more chances of being noticed. The best job hunting tactics in the 21st century are advertising for employees on the internet which is a cost effective aspect. Instead of publishing on national, local and regional newspapers, posting ads online is beneficial and would reach a large mass. A single fee is ample for publishing, unlimited job listings. When newspapers are considered, payments are required per word. In this manner 21st century has a number of job sites to register and get employed. Using paper resumes and submitting for each company has vanished. The 21st century is making use of emails which is attached to the email body and sent to different employers. Attaching file is of varied types such as Microsoft word, PDF file, plain HTML etc. The resume can be tailored according to the position applied for instead of having a broad overview. In case your resume matches a number of roles and positions, you can use many resumes highlighting skills for each job. These are beneficial aspects in the 21st century regarding the job search. Building networks and enhancing professional contacts is possible in the 21st century. During the process of job hunt, developing network with professional contact with the help of social media network is possible. By this way vacancies and job request can be achieved. Networking plays an important role in job search. The 21st century has paved way for many companies to develop their own websites and a careers section. Certain companies accept resumes only through their websites which is possible these days. If you’re interested in any company researching the company website and then proceeding further is one of the best strategy for job hunt in the 21st century. By this way processing of application is achieved immediately. Some companies also register candidates and update them at times of vacancy for a particular position. Professional associations are first advertised about job vacancies rather than the public. The best way 21st century has offered is to get registered with professional associations and attract people who work in your desired field. For job contacts, development activities and lot more professional associations are rich sources to start from. The internet which is a major tool assists all job questers in writing a perfect resume appropriate to the desires of the employer. All tips for writing a resume and samples for any designation are available online. Job seekers hence can prepare a perfect resume which would be suitable for job search and make them stand out. As mentioned, the web shows you the right path for interview with all interview tips and hints. By reading through the various blogs and articles one can get to know the interview environment and the air around. So getting prepared for a new situation comforts job seekers in this 21st century. The 21st century has made receiving an interview call a bit easier as there are numerous agencies, consultancies and recruiters who work to offer interview chances for job seekers. Job questers can just forward their resume to agencies and they take complete care and send them for interviews when chance arises. 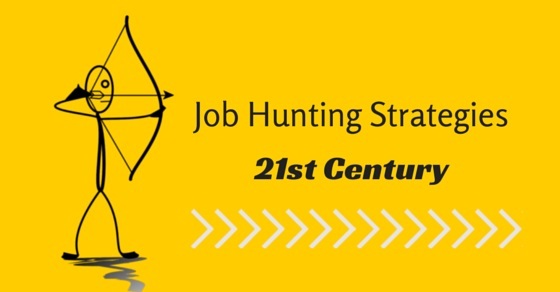 This is a major job hunting strategy that has evolved the 21st century. The 21st century has opened up doors for a legion of job sites. Registering with the numerous job sites is one way which adds advantage to job search. All details regarding graduation are filled in and the job sites will contact you in case vacancies are available. In this manner 21st century has made job search uncomplicated as applying for multiple companies is accomplished from desktop. Setting up email alerts are yet another strategy which is used by applicants in the 21st century. Every one applies for jobs each day, whereas setting up email alerts can be advantageous as it offers more importance than other mails in your inbox. Understanding and embracing today’s job market is the main task for any individual to get recruited easily. It is also important to focus on cover letters and resume, in order to stand out of the crowd and get highlighted. The usage of internet and development of professional network is the main way through which job hunting can be accomplished in the 21st century.